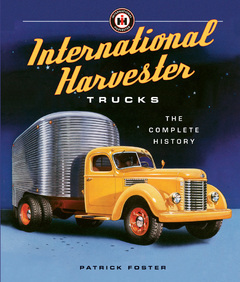 The International Truck and Engine Corporation has built the trucks that have been a staple of both agricultural and industrial trucking for nearly 100 years. Here’s a look at 10 trucks of the new millennium from International Harvester Trucks. Replacing the well-loved 4700 in the 2001 model year was the new 4300, one of the long-awaited Next Generation Vehicles [NGV]. Featuring an all-new galvanized steel cab with a large curved windshield and sloping hood for improved aerodynamics, the cab itself rode on air bags for superb riding comfort. Also featured were easy-entry doors with larger windows and a three-piece hood designed for easier access to the engine. New for 2004 was the CF series of low cab forward [LCF] trucks, which were vocational models in the lower-medium ranges. Marking the company’s return to the Class 4 and 5 markets, these new trucks were built in Mexico and powered by Navistar’s V-6 diesel engine. Shown is a 2006 model. Introduced in 2006, the Navistar Joint Light Tactical Vehicle [JLTV] was aimed at replacing the outdated Humvee. A clean-styled, low-profile utility truck, it was more powerful, faster, and better armored than the Humvee. Do Class 8 trucks get any better-looking than this? The 2009 LoneStar, with built-in sleeper compartment, is a stylish truck that is also a rugged workhorse. Here we see the Navistar military assembly line, which was a beehive of activity during 2008 when this photo was taken. During 2008, Navistar boasted a large portfolio of military vehicles, as shown in this photo. MRAPs, cargo trucks, over-the-road haulers, and many other versions were available. Navistar entered the 2011 model year in good shape, with a broad portfolio of trucks and buses all built on a common platform and powered by Navistar’s own engines. The company was also able to field this new TerraStar in the Class 4–5 market, which quickly grabbed 5 percent of that market. Another great product during 2011 was the heavy-duty Workstar, shown here with a refuse body. This year Navistar’s school bus market share was down to 48 percent, but medium truck share rose to 41 percent. Heavy truck share was 17 percent, good for second place inthe market. A glimpse of what’s coming in International trucks is seen in this exciting new Project Horizon Concept Truck. The Horizon concept is loaded with new innovations in power train technology, ergonomics, and aerodynamics. It is literally the truck of the future. These look like Oshkosh vehicles, but they are circa 2012 ATX 6 and ATX 8 tactical military trucks built by Navistar.